kl. 12:00 - 13:00 allir bræður eru velkomnir. 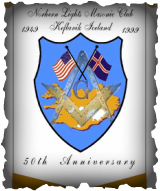 The Northern Lights Masonic Club meetings are held every 3rd Thursday of the each month at 12:00 until 13:00 hrs. in the Sindri Lodge # 9 at Bakkastig 16 Njardvik. All brothers of recognized lodges are encouraged to join their brethren and continue their Masonic association.